Perhaps more than any other truck camper manufacturer, the management team at Adventurer Manufacturing intently listens to their dealer network, customer base, and even the survey results and reviews published in Truck Camper Magazine. What do inquiring Adventurer Manufacturing managers want to know? How to make their truck campers even better. Adventurer Manufacturing doesn’t make changes for change sake, but they don’t hesitate to update what their dealers and customers suggests needs attention. Making updates based on feedback may sound like an easy process, but it can be quite complex. Many facets of production are fixed and/or extremely difficult to improve. Cost, availability, and strict building and safety codes can thwart even the most compelling suggestions. Likely Answer 1: It would violate a build or safety code. Likely Answer 2: They can’t get those parts in consistent enough quantity, or quality. Likely Answer 3: The material/component/concept would be prohibitively expensive. In the face of these challenges, some truck camper manufacturers don’t update or change their campers year to year. Fortunately, that’s not the culture at Adventurer Manufacturing. If there’s a way to make their campers better, they’re going to find it and do everything they can to put into production. 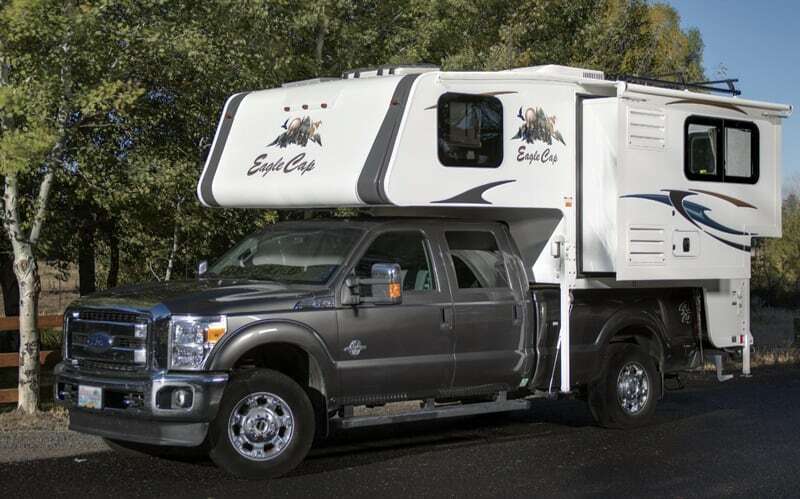 For 2019, Adventurer Manufacturing has a nice list of upgrades and improvements for Eagle Cap campers. Most of the changes are a direct result of listening. How did they decide to make the following changes? Enough of us said something, and they heard you. For the official 2019 Eagle Cap product announcements, we talked to Greg Tucknies, National Sales Manager for Adventurer Manufacturing. Above: 2019 Eagle Cap 811. All photography provided by Adventurer Manufacturing. Are there any Eagle Cap models being discontinued for 2019? We have discontinued the 850 for 2019. As our standard operating procedure goes, we let the market tell us what goes, and the 811 has now replaced the 850. The 850 was also the last model under the Eagle Cap styling. We made some tweaks, like the full-wall slide, but now the 850 is gone. For the debut of the Eagle Cap 811, you suggested that it might beat the 850 in the marketplace. Why do you think the 811 sold better than the 850? The 811 floor plan is a more open floor plan. It is larger than its size dictates. With the 811, you can fit a generator in a long or short bed configuration. It opens up more of the market to this camper. We always try to fit long or short bed trucks. The 811 also has a bigger bathroom. The 811’s design was built off the success of the Adventurer 89RBS. For 2019, you are continuing with the two interior choices that were announced for 2018; Domino (brown tones) and Denim (grey tones). Why are you staying with these two interiors? Last year was the first time we hired interior designers to design our decors. The resulting two Eagle Cap interiors – Domino and Denim – have been very well received. While we are always looking to improve our campers, the new Eagle Cap interiors are still performing extremely well. The Domino decor features a leather accent. People either love it or hate it. Of our customer sold units, about 60-percent are Domino and 40-percent are Denim. It really seems to come down to liking the leather look, or not.